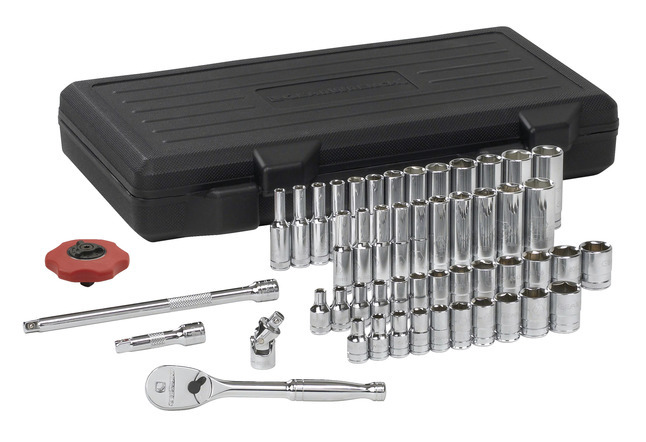 Gearwrench 1/4 in Drive SAE/Metric Socket Set comprises of 51 pieces of 6-point sockets that include an universal joint, thumbwheel ratchet, full polish teardrop ratchet, 2 in and 6 in standard extension, 10 standard SAE sockets, 13 standard metric sockets, 10 deep SAE sockets and 13 deep metric sockets all packaged in a blow mold case. The standard SAE sockets are sized 3/16 in, 7/32 in, 1/4 in, 9/32 in, 5/16 in, 11/32 in, 3/8 in, 7/16 in, 1/2 in and 9/16 in. The standard metric sockets sizes include 4 mm, 5 mm, 5.5 mm, 6 mm, 7 mm, 8 mm, 9 mm, 10 mm, 11 mm, 12 mm, 13 mm, 14 mm and 15 mm. The deep SAE sockets are sized 3/16 in, 7/32 in, 1/4 in, 9/32 in, 5/16 in, 11/32 in, 3/8 in, 7/16 in, 1/2 in and 9/16 in. The deep metric sockets sizes include 4 mm, 5 mm, 5.5 mm, 6 mm, 7 mm, 8 mm, 9 mm, 10 mm, 11 mm, 12 mm, 13 mm, 14 mm and 15 mm.